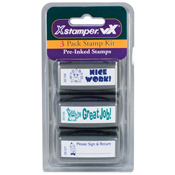 Xstamper vX teacher stamps help you positively reinforce and motivate your students! All inspirational impressions come in the highly valued pre-inked XstamperVX mounts. They initially make at least 20,000 impressions before re-inking is needed. Use Xstamper Refill Ink only. Any use of any other ink will void out the warranty.